20 gardens will be open on Sunday June 15 from 1-5.30. Cost is £3 per adult, children free. All proceeds go to Celebrating Cromford, which runs a series of events in the village throughout the year, distributing any profits to other local voluntary organisations. This year we have made donations to Cromford Playgroup, Primary School,the Community Centre, Derwent Valley Donkey Sanctuary and Cromford Brownies. Given the unique nature of the village of Cromford, our Open Gardens include 'peep-overs', hidden nooks and crannies, gardens across many different levels, and some places that just offer a view not normally available. 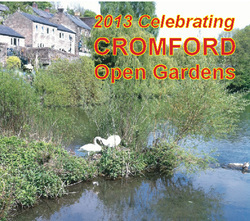 Tickets for the Open Gardens are available from the Celebrating Cromford stall on Scarthin Promenade from 11.00 am on Saturday until 5.00 pm on Sunday. The ticket takes the form of a map and a description of each garden including advice on ease of access. There are many opportunities for refreshment of many different kinds in the village as you visit the gardens - from beer festivals to elegant afternoon tea. We do hope you will come and visit us.